If you had ever wondered what happens to people who appear on Masterchef then wonder no more….. they graduate to the now well established food destination of Brixton! Ollie (one of the brothers in the last series) and Hayden are serving food as part of the new food corner on Station Road. There are about 9 or 10 street vendors that add to the jerk chicken and falafel stalls which are an everyday occurrence outside the Brixton Recreation Centre. We are trying to review them all so will hopefully manage to get round them all by the end of the summer. We usually start the post with a description of the interior of the restaurant but this is a street in Brixton – it was a sunny day and there is a place to sit opposite the food stall – under a cover for inclement weather. 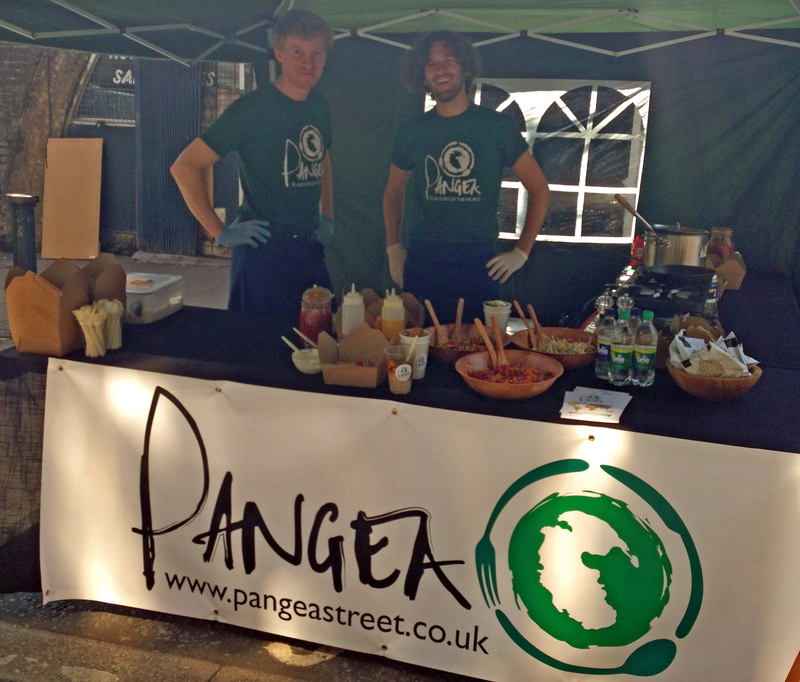 On this visit Pangea was selling vegetarian food but their leaflet describes fish dishes (BBQ Harissa Mackerel, Almonds, Pomegranate) and meat (English Pork Belly and Lobster, Cider reduction, pea puree) all descriptions more complex than we could imagine from the offering on our Friday visit. Available on this visit was lentil and potato curry topped with some nuts and (if you want it) tomato chili jam. There were three salad choices – all with brown rice and one of two dressings. We had the curry without the prawns and a cabbage and carrot salad with a soy and honey dressing. Although our day was vegetarian day they offer to grill a few prawns to add to the curry. So down to the flavour – salad was lovely, crunchy but a bit sweeter than my taste but it was my choice of dressing so next time I’ll choose the other one. The green lentil and potato curry was hot but not enough to make my nose run and wasn’t delicate – it was hearty. Just what I wanted for a Friday lunch. As with any street food you balance the cost, size and delicacy of the food. This is cheap – £2.50 for either the salad or the curry. Food comes in in a largish plastic cup perfect for a take away lunch and walking around the market with. Whilst chatting with the owners we were also told that they provide private catering for parties. So – our view – we think the balance is definitely on their side and we do definitely intend to return. One blessing is that the choice was narrow – a long menu makes it so difficult and you always think you should have chosen something else. The salads – given the imminent good weather – will be certainly be a hit. 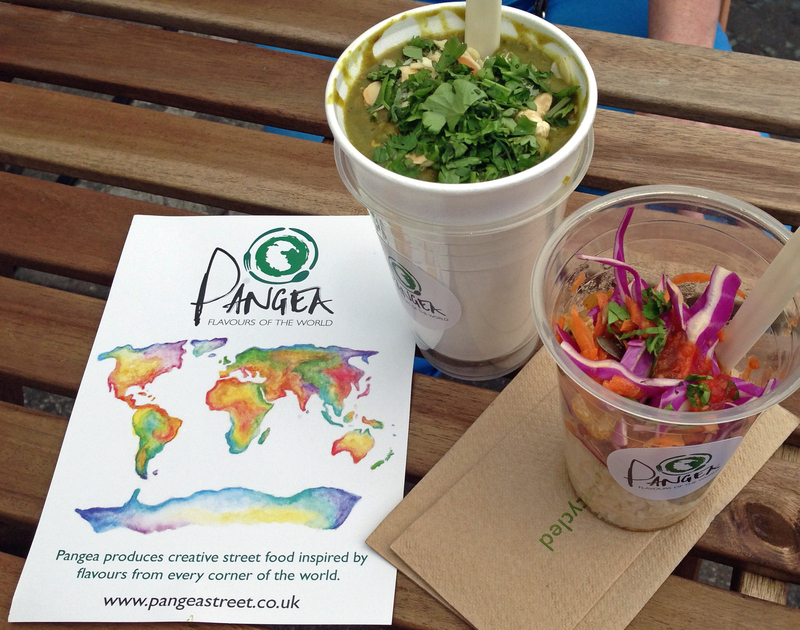 You can be a step ahead and try this stall out now – it is open Monday to Saturday and the big launch is next week.